The first Church of God Regional Convention of 2018 has come and gone, but the impact is still being felt by those who descended upon the desert Southwest last week. For several days, social media was abuzz with pictures and posts from the event, giving people across the country a glimpse of what these events have to offer. Beginning Tuesday, April 24, for much of the Church of God, especially those in the central region of the country, the “Receive, Hear, Embrace Life” experience will come into full view. A tremendous lineup of speakers and worship leaders are slated to inspire, challenge, and equip pastors and laypeople to reclaim what hell has stolen in their cities and towns. Crossings Community Church in Oklahoma City is perfectly suited to open their doors, once again, for another life-giving gathering of the Church of God. Sunshine greets guests of the Regional Convention on Monday. When the Church of God in the United States and Canada first convened in Oklahoma in June 2014, it was both history, and history in the making. After more than a century of meetings in Anderson, Indiana, the Movement returned to its roots—in Oklahoma, that is. When historians Dale Stultz and Doug Welch released the groundbreaking book The Gospel Trumpet Years in 2011, we learned that the totality of what we thought we knew about Church of God history was only part of the story. Besides the kingdom contributions of Mary Cole to the formation of the Church of God, many of which predated D. S. Warner, Oklahoma was a foundational setting for ministry among pioneer leaders like Nora Hunter, John Morrison, and Lena Shoffner Matthesen. Names like Dale Oldham, H. M. Riggle, Herb and Lola Thompson, Steele Smith, Lawrence Chestnut, and Chuck and Donna Thomas also have considerable Oklahoma connections. 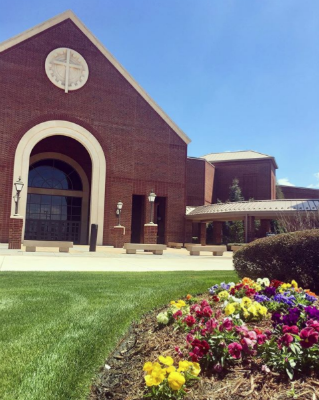 Today, not only is Oklahoma home to Mid-America Christian University, but it is also home to one of the largest and most influential Church of God congregations anywhere: Crossings Community Church. Led by senior pastor Marty Grubbs for the past thirty-one years, the flock of more than 7,000 is the source of a wide array of transformative ministries touching the city, state, country, and world for Jesus Christ. 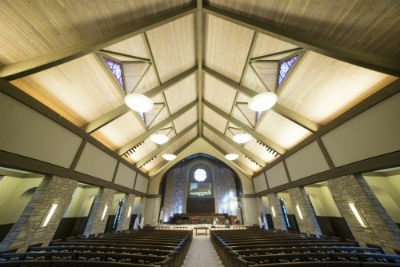 As his biography states, “Driven by the foundational and ever-relevant elements of the church in Acts 2, Marty inspires his congregation to live out their mission statement: to be a Christ-centered church committed to live by faith, to be a voice of hope, and to be known by love.” Guests from across the country this week have the chance to worship, learn, and grow in a place where transformation and dynamic ministry is never-ceasing. 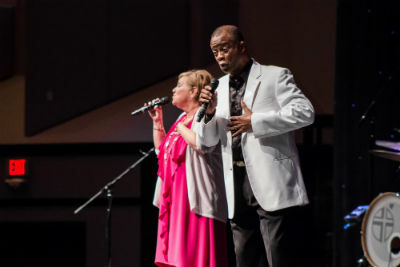 Sandi Patty, now on staff at Crossings, sings with Larnelle Harris in 2015. Indeed, Church of God guests of the second 2018 Regional Convention will enjoy sitting under the teaching of Pastor Marty Grubbs. Other staff will offer electives in the afternoon, affording convention-goers the opportunity hear directly from persons on the front lines of their influential church. Regional guest speaker Don Wilson from Phoenix will speak again, as will Jo Anne Lyon, Jeff Whye, and Jim Lyon. On Tuesday, Ben Hardman and Gravity Leadership will conduct a discipleship training seminar and Jim Lyon will offer the opening message. Following along or participating via social media? Don’t forget to use #LifeOKC! It’s going to be a great week! Learn more about this and upcoming Regional Conventions at www.chogconvention.org. This entry was posted in All Church of God, Central, Church of God Convention and tagged camp meeting, Campmeeting, Crossings Community Church, Embrace Life, Hear Life, history, Life OKC, LifeOKC, Marty Grubbs, OK, OKC, Oklahoma, Oklahoma City, Receive Life, regional, Regional Convention 2018. Bookmark the permalink.